What would you do if every important file on your computer was suddenly gone? And the only way to get those precious files back was to pay an anonymous internet criminal hundreds of dollars to return them? That’s the situation thousands of individuals and organizations worldwide have lived through in the past few months. Ransomware is a particularly evil type of malware that encrypts data on your computer so you can no longer access it. The key to decrypt your files is held by whoever is in control of the ransomware software, and they expect you to pay a hefty fee to get that decryption key from them. The most widespread ransomware infection going around lately is called “CryptoLocker”. Once of computer if infected with CryptoLocker it silently encrypts files using 2048-bit public key encryption. 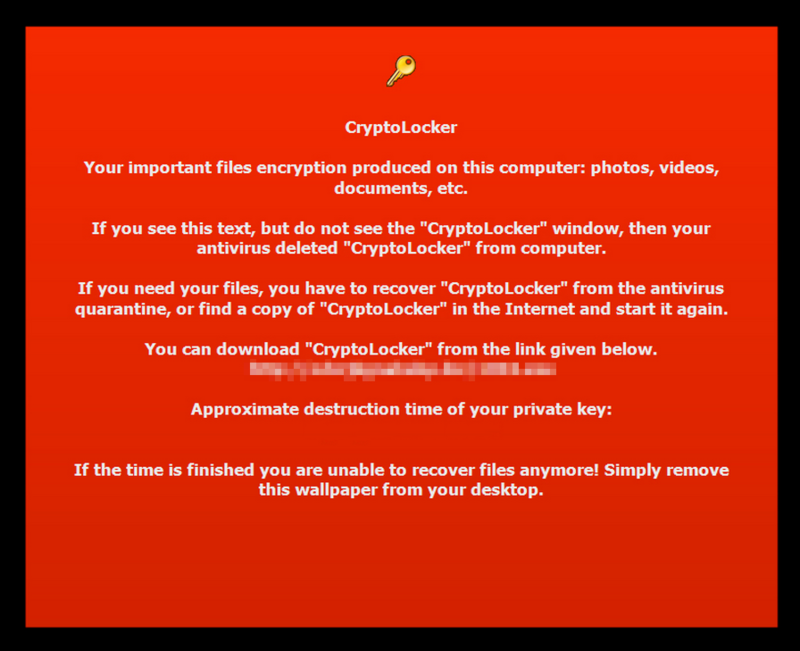 After the victims files are encrypted, CryptoLocker displays a notice on the infected computer’s screen notifying the user they must now pay a ransom in order to get their files back. Normally security experts say you should never pay fees demanded by malicious programs, but that’s not the case here. CryptoLocker’s 2048-bit encryption is unbreakable by any existing technology unless you’re willing to wait about 6 quadrillion years. If you want your files back any sooner you’re stuck paying the ransom. So far it looks like many people have chosen to pay. We’ve been able to track more than $25,000 in fees CryptoLocker has managed to pull in so far, but the real total is likely several times greater. If your computer hasn’t fallen victim to ransomware like CryptoLocker yet, there are a few steps you can take to minimize your chances of infection and the damage caused if your computer does somehow become infected. First and foremost, make sure you’re using up to date antivirus and anti-spyware software. While this software cannot protect from all malware at all times it can at least be a very effective first line of defense. Using a free tool called CryptoPrevent you can block the normal entry points used by CryptoLocker and prevent it from being able to run on your computer at all. You should also have recent backups of all of your important files. This protects you in the event of ransomware infections, hardware failures, user error, and any other event leading to data loss. Ideally these backups should not be stored on your computer, or any device that can be written to by your computer like USB drives and external hard drives. An online backup service is the easiest and most effective way to ensure you have secure copies of your files. Look for an online backup service that stores multiple versions of your files. That way you can recover them even if they’ve recently been changed which is what happens when CryptoLocker and other ransomware encrypt or overwrite your files. ZookaWare offers our own unlimited online backup program called CloudZooka which saves multiple versions of files when they are backed up, but other backup programs may also work. Using the steps above you can minimize the effects of CryptoLocker and just about any other kind of ransomware malware. With a very small amount of preparation, you can save yourself the heartache, hassle, and financial pain that comes with a ransomware infection. I think we’ve all been there at some point: We’re installing some new software program, maybe not paying as much attention as we should be, clicking “Next” or “I agree” as fast as we can just to get through the software installation process. The next time we open up our web browser, however, we’re greeted with an obnoxious toolbar. Browser toolbars aren’t simply benign annoyances either. Beyond simply taking up space on your screen and potentially slowing down your browser’s responsiveness, they track your actions online and sell that information that whomever will buy it. That’s their business model, for the most part. You’re not the customer of adware and other malware, you’re the product being sold. Or at least your information is. It’s normally possible to go into your browser and manually remove unwanted browser toolbars, rogue addons and search engine redirectors. But it’s a tedious, time consuming process, and you need to know where to look to make the changes. This is especially true if you have more than one browser. Removing half a dozen toolbars and rogue toolbars can easily become an hour long ordeal if you’re having to try to clean up multiple browsers. I fix a lot of computers. A LOT of computers. All that time spent manually removing toolbars adds up quick. So lately I’ve been using a tool called “AdwCleaner” to automate the process. 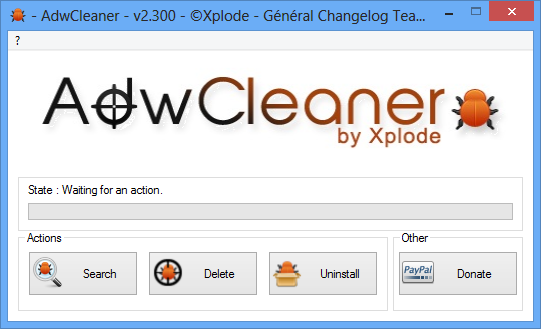 AdwCleaner stands for “Adware Cleaner”, but it’s not your typical malware removal tool. You don’t download new detection updates for it like you would for SpyZooka or MalwareByte’s. It’s very specialized for removing a specific set of very persistent malware and Potentially Unwanted Programs (PUPs) like browser toolbars. It’s a very powerful tool, and very good at what it’s intended for, but it’s not something you’d want to run every day. You’re not given a lot of options on what AdwCleaner removes. If it finds a program or toolbar that is in its detection list, it will remove the offender without consulting you first. Also, after removing any malware, it forces you to restart your computer, which allows it to ensure that the malware processes aren’t started again. If toolbars are making your browsing cluttered and slow, you may want to give AdwCleaner a try. It’s very simple to use, just run the program and click the “Delete” button to remove any detectable malware on your system.